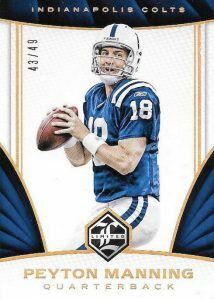 2016 Panini Limited Football marks the brand's return to action after sitting on the sidelines for a season. 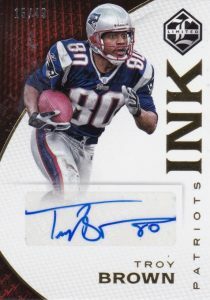 Each hobby box includes one on-card rookie auto relic as well as two other hits. 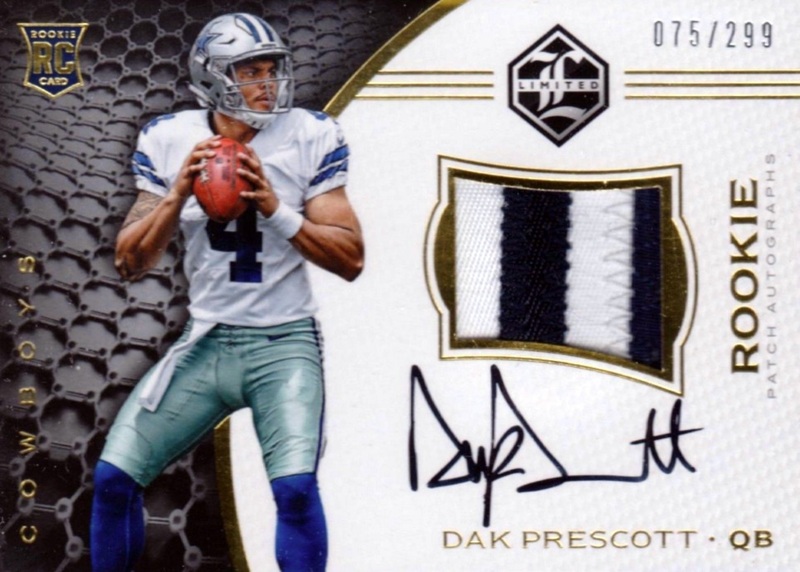 Headlined by Rookie Patch Autographs that fall in every box, the hard-signed rookie cards cover the top names from the 2016 draft like Ezekiel Elliott and Dak Prescott. Parallels include Sapphire Spotlight and Ruby Spotlight. There are also limited Variations, numbered to only 25 copies. In addition, the product should feature a standard base set and parallels. 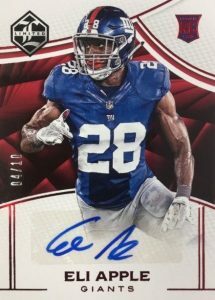 Other autographs in 2016 Panini Limited Football include Team Trademark Signatures and Limited Monikers. These on-card autographs are geared to the veterans players and retired greats. 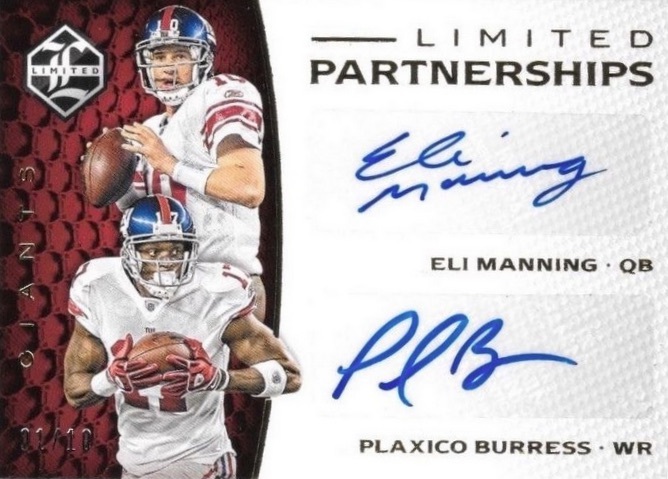 Limited Partnerships comes in both Dual (#/49 or less) and Triple (#/10 or less) versions with a focus on current or former teammates. 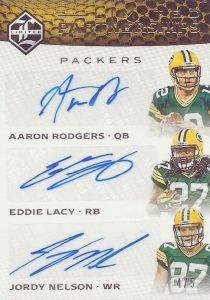 The multi-player cards feature sticker autographs. Rounding out the product are book cards with multiple elements in play. 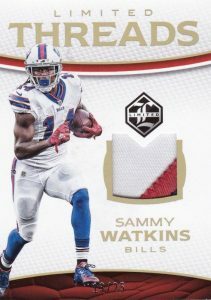 Draft Day Signatures pairs a rookie autograph with a relic piece from the actual jersey presented on-stage at the 2016 NFL Draft. 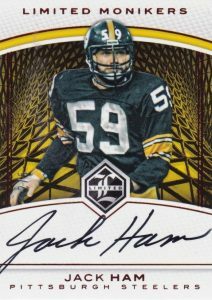 Honoring past and present, the Limited Cuts Dual Booklet insert combines a current signature with a cut autograph from an all-time great. PARALLEL CARDS: Silver Spotlight #/99, Gold Spotlight #/49, Ruby Spotlight #/10, Sapphire Spotlight 1/1, Printing Plates 1/1. PARALLEL CARDS: Silver Spotlight #/49, Gold Spotlight #/25, Ruby Spotlight #/10, Sapphire Spotlight 1/1 (no card #118). PARALLEL CARDS: Gold Spotlight #/25, Ruby #/10, Sapphire Spotlight 1/1, Printing Plates 1/1. Not all subjects found in parallels. View the spreadsheet for full breakdowns. 18 cards. Serial numbered #/55. 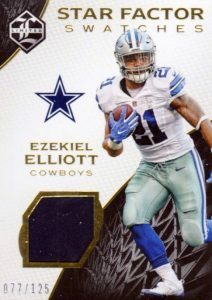 PARALLEL CARDS: Silver Spotlight #/35, Gold Spotlight #/25 or #/10, Ruby Spotlight #/10 or #/5, Sapphire Spotlight 1/1, Printing Plates 1/1. Not all subjects found in Silver, Gold or Ruby parallel. View the spreadsheet for full breakdowns. PARALLEL CARDS: Silver Spotlight #/25, Gold Spotlight #/15, Ruby Spotlight #/10 or #/5, Sapphire Spotlight 1/1, Printing Plates 1/1. PARALLEL CARDS: Sapphire Spotlight 1/1, Printing Plates 1/1. PARALLEL CARDS: Prime #/25 or less (No card #1,13), Tag 1/1 (No card #1,21). View the spreadsheet for specific parallel details. PARALLEL CARDS: Silver Spotlight #/49, Gold Spotlight #/25, Ruby Spotlight #/10, Sapphire Spotlight 1/1. PARALLEL CARDS: Prime #/25 or #/5 (No card #13), Tag 1/1 (No card #5). 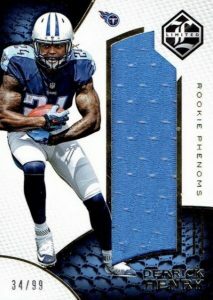 PARALLEL CARDS: Prime #/25 or less (No card #14), Tag 1/1. Not all subjects found in Tag parallel. View the spreadsheet for full breakdowns. PARALLEL CARDS: Silver Spotlight #/35, Gold Spotlight #/25, Ruby Spotlight #/10 or #/5, Sapphire Spotlight 1/1, Printing Plates 1/1. Nice, this set was my favorite box to open in 2014. Far better value than the basketball issue, but terrible collation nonetheless. In five boxes, I received six duplicate autographs and/or jersey cards, including two Alex Collins redemptions. Also got two of the rare Super Bowl autographs, both of the same player!